Part of a group of pioneers arriving at the settlement of Auraria in 1859, A C Hunt was drawn to Denver , like the many men who would come after, by dreams of gold. He had just lost his fortune in the Wall Street Panic of 1857 when reports that the mineral was found in the Cherry Creek reached him in California. Upon arriving, his interests and opportunities landed him on the west side. We know that he partnered with John M. Clark in a livery business in the heart of the Auraria settlement and served, at least temporarily, as the Vice-President of the Auraria Town Company. Hunt was obviously well-respected member of the community, as seen by his selection as Judge of the “People’s Court” in 1859. His swift attention to the dangerous criminals and vagabonds that terrorized the early pioneers would lead to his appointment to U.S. Marshall of the Territory of Colorado. His house was located on the land we now refer to as Lincoln Park, although some evidence suggests he may have been in possession of the land comprising the entire neighborhood. Records do show that he sold the lots that housed the jail on the corner of what is now Speer and Colfax to the city for that purpose, and donated the land on which his home stood for the construction of a courthouse he believed the city desperately needed. The powers and purses that be, were not yet ready to build it, so Lincoln Park became one of the city’s first parks. The home was described in 1870 as a showplace of the city, as a “pretty story and a half brick home standing in a wide park of evergreens and cottonwoods, the door approached with a winding drive.” By that time he was serving as our 4th Governor of the Colorado Territory, appointed in reward for keeping peace with the native Americans as both US Marshal and Ex-Officio Superintendent of Indian Affairs. His governorship is noted largely for officially moving the Capital from Golden to Denver, and for his brokering peace between the native tribes and white settlers across the region. Hunt’s good relationship with the natives is also credited with saving the lives of several prominent Denver citizens when they encountered members of the Ute tribe while on a camping trip near Buena Vista in 1869. Like other founding fathers, Hunt was obviously interested in the investment potential of utilities. He was among the first to recognize the importance that water infrastructure would have to the community. 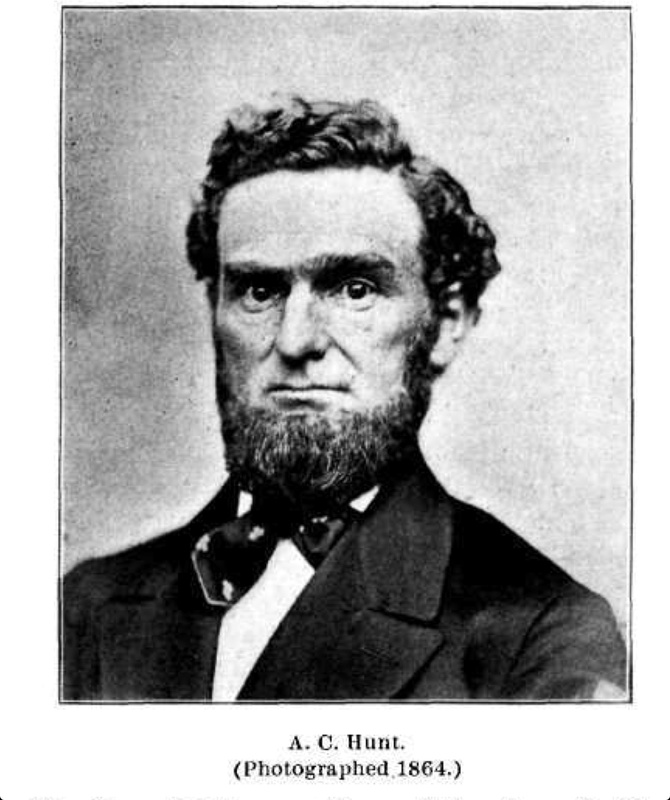 As President of the Capital Hydraulic Company of Auraria, in 1859 he began digging irrigation ditches, an investment in the future of the settlement and his legacy. Denver’s Merchant Mill Ditch would eventually run through Lincoln Park, and today we still have Denver Water within the neighborhood boundaries. These are good topics for a future post. A C Hunt is also largely credited with bringing the Denver & Rio Grande Railroad to Denver. Though not the first line built, it was enormously influential in the development and explosion of the city. He left Denver in 1886 for Laredo, Texas to pursue his next challenge, the Mexican Central railroad. Undoubtedly, his departure was a loss for Denver, and likely impacted the fate of West Denver, and the residents of La Alma/Lincoln Park.